Hiki-Sada, who was selected as the successor of the Seki-Kanesada lineage, was the adopted son of No-Sada. No-Sada´s bodily son Magoshirō Kanesada (孫四郎兼定) was a swordsmith too and this chapter deals now with him. No-Sada was a deeply religious man who even published a sutra at his own expense, but more about that later. Magoshirō worshipped Akashagarbha (Jap. Kokūzō, 虚空蔵), the Bodhisattva of “boundless space treasure,” because his blessing and wisdom is as unlimited as the universe. Some depict him with a sword in his right hand, quite like Bodhisattva Monju from this story. In Japan the so-called jūsan-mairi (十三参り, lit. “temple visit of the thirteen”) was practiced at the 13th day of the third lunar month. *1 At this visit, Kokūzō is asked for wisdom, luck, and prosperity for all children having reached the age of 13. Now we can speculate that such a jūsan-mairi – or maybe the sword in the hand of a Kokūzō statue – had such an impression on Magoshirō Kanesada that he devoted his life as a smith to this deity. However, Magoshirō went around the country as a pilgrim, to pray at the temples which are dedicated to Kokūzō or where a statue of Kokūzō was erected. One day he came to the village of Yanaizu (柳津, present-day Ibaraki Prefecture) close to Kurokawa Castle (黒川城)*2 in northern Mutsu province. People said that the „Yanaizu-Kokūzō“ statue had caused some miracles in the past. Lord of the castle and the adjacent lands was Ashina Moriuji (蘆名盛氏, 1521-1580) who was a clever strategist but who had the problem that not a single swordsmith lived in the lands controlled by him. Desperately he forwarded an order to each and every hostel: “It must be reported without delay if there is a swordsmith among the travellers!” Of course Kanesada didn´t know anything of this order when he entered the hostel at Bange (坂下) about twelve kilometres away from Kurokawa Castle one evening . The landlord asked Kanesada: “Please give me your name and your address.” After doing so the landlord asked him again: “Oh, you are from Seki! There are many swordsmiths in Seki, aren´t they?,” and Kanesada replied: “Yes, and I am one of them…” At the next morning Kanesada put on new straw sandals to visit the Yanaizu-Kokūzō. The temple complex of the Enzō-ji (円蔵寺) to which the statue hall belonged covered a range of hills at the bluff of River Tadami (只見川). According to legend, the temple was erected in the second year of Jahr Daidō (大同, 807) by the famous monk Mönch Kūkai (空海, 774-835),*3 and also the 54,5 cm high statue of Kokūzō is attributed to him. Large parts of the complex were destroyed by a flood in the third year of Genna (元和, 1617) and the buildings extant today go back to a rebuilding of the Rinzai sect in Kan´ei four (寛永, 1627). After his prayers in front of the statue and a tour of the temple complex, Kanesada returned to Bange two days later. It was already evening and so the smith relaxed with a cup of tea in the bathroom of the hostel. Shortly later the landlord came in and made an important announcement: “Mr. Magoshirō, unfortunately I am not allowed to let you depart tomorrow because my Lord´s envoy comes from the castle to talk to you. So I apologize and ask you to stay until he arrives.” That means the landlord had made his report as was ordered by him whilst Kanesada was visiting the temple. Well, Kanesada was not in a hurry but after asking the landlord about the backgrounds, he told him that he didn´t plan to settle down in this area of harsh winters and masses of snow as high as a house. Ashina Moriuji´s envoy came the next day and submitted him an offer but Kanesada rejected. “If this is the case, I ask you to stay once more a little longer as long as I have forwarded your answer to my Lord,” he said and returned to Kurokawa Castle. But Moriuji secretly looked forward to a cooperation with the smith from the famous Kanesada lineage and so he sent his envoy day after day. This back and forth developed into a kind of ordeal and so Moriuji had the idea to send his most beautiful lady-in-waiting instead of the envoy, to convince the smith with her “arguments.” Sooner said than done a sedan arrived at the hostel and a gorgeous young woman went to the room of Magoshirō Kanesada. He listened to her speech and because he never saw such a beautiful woman in his home country Mino, he was swept away and finally agreed. And so it came that a branch of the Seki-Kanesada lineage worked for over 13 generations and under different lords in the distant province of Mutsu (the later Iwashiro, 岩代) until the end of the Edo period. So when one come across a sword which is not signed “Nōshū Seki-jū Kanesada” (濃州関住兼定, “Kanesada, resident of Seki in Mino province”) as usual but “Ōshū-jū Kanesada” (奥州住兼定, “Kanesada, resident in Mutsu province”), he should remember this small anecdote and the backgrounds of Kanesada´s moving to the north of Japan. As mentioned at the beginning, Magoshirō´s father No-Sada once published a sutra. Unfortunately it is not handed down which generation initiated this publishing but on the basis of the inscription “Nōshū Seki Kanesada” (濃州関兼定) and the date “Eishō-gan kinoe-ne kugatsu-hi” (永正元甲子九月日, “a day in the ninth month of the first year of Eishō , year of the rat,” see picture below at the right and left side of the ornamental box to the left, marked with three dots each), it is likely that it goes back to No-Sada. The sutra itself is the so-called Kannon-Sutra (観音経),*4 or rather actually the 25th chapter of the Lotos-Sutra (Hokke-kyō, 法華経 or Myōhōrenge-kyō, 妙法蓮華経). Several such sutra were published in 15th century Mino because book printing flourished under the economic upturn of the reign of the Toki (土岐) and Saitō (斎藤) families. They were used at Buddhist funeral masses but only very few are extant of which also the exact circumstances of their publication are known. Last page of Kanesada´s Kannon-Sutra. The text of this sutra is decorated with gorgeous illustrations. But we can assume that the sutra in question was published before that time because after receiving the title, it would surely be mentioned in the box in the top picture. When we now allow our imagination to run free, we could assume that the sutra was published on the death of No-Sada´s adoptive father, the first generation Kanesada, who worked in the Bunmei era (文明, 1469-1487). 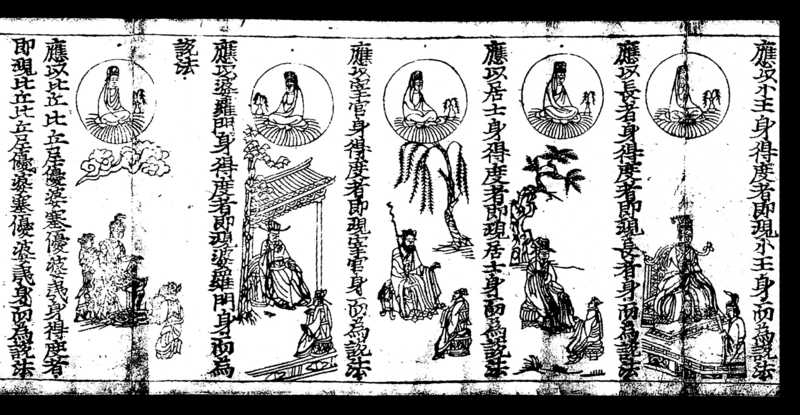 The sutra of Kanesada is nowadays preserved in the British Library. It was once brought along by the diplomat Ernest Mason Satow (1843-1929) who made important contributions to the British-Japanese relationship during the Meiji era. Satow spoke Japanese, worked as translator and interpreter, and owned a library of classical Japanese literatiry containing more than 2,600 books. 320 of these books went later in the possession of the British Library – among Kanesada´s sutra – and 380 to the university library of Cambridge. *1 Nowadays this ritual or festival is held on April 13. *2 The later Aizu-Wakamatsu Castle (会津若松城). *3 Better known under his posthumous title Kōbō Daishi (弘法大師). He was the founder of Japanese Shingon school of Buddhism. *4 This chapter, with full name Kanze´on Bosatsu Fumon Bon (観世音菩薩普門品), deals with the various transformations and miraculous powers of Avalōkiteshvara (jap. Kannon, 観音 or Kanze´on, 観世音), the Bodhisattva of mercy. *5 This is a Buddhist name for a dead person (inden-gō, 院殿号). 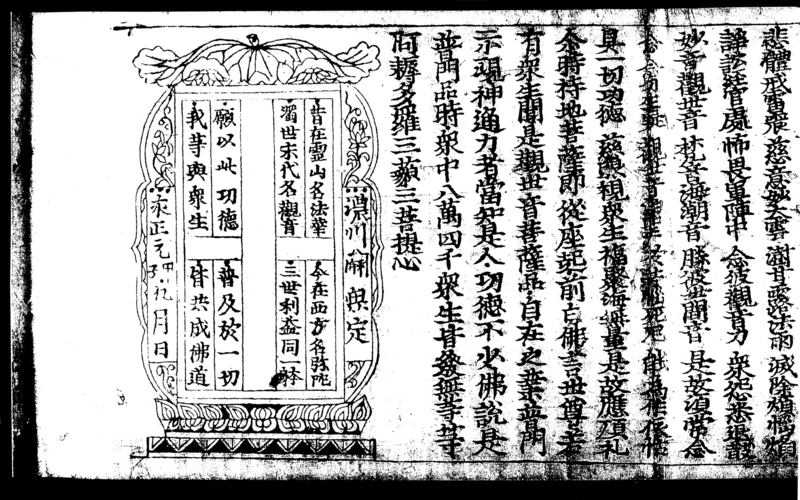 Because there were several persons who received the name Ji´un as their posthumous name we can´t say for whom this sutra was printed.